Who Met at the Tree? Warshinun’s Arapaho band held meetings at the distinctive cottonwood, which was struck by lighting numerous times and accidentally set on fire at least once during its 120- year lifespan. When the once great tree was removed in the 1950’s, 300 pounds of lead bullets, a projectile point, and an arrow shaft were found lodged in its trunk. That is not the only remarkable fact about the council tree, and here is your chance to learn more! Here is a physical piece of bark from the council tree, the rest of the tree was burned down by a ditch fire. Click the link to see more photographs! Chief friday and his band of Arapaho tribesmen met regularly at the council Tree until they were moved to a reservation in Wyoming in 1876. 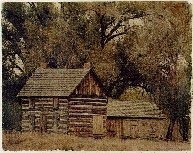 Robert Strauss moved to the Cache la Poudre River in 1864, but his house was quickly swept away and so he moved further downriver and built what would become known as the Strauss Cabin just across from the Council Tree. This location caused Strauss to have regular interactions with the local Native American tribes and local settlers interested in the tree until his death in 1904. The cabin was originally renovated and opened as a local history museum but was burnt to the ground by arson shortly after. Strauss was never married and the myth is that he died alone in a flood. his neighbors found him hugging a post near the tree after being driven from his home in flood waters. after his death, his property was sold and farmed for several decades before succumbing to development. The Colorado Cavalry’s first interaction with Native Americans at the tree occurred in the late 1850’s when a patrol through Indian territory discovered a Ute woman about to be executed at the tree by some of the Arapaho. The Cavalrymen rescued her and returned her to her tribe shortly afterward. The cavalry continued to meet with native americans at the council tree into the late 1870’s. it’s assumed that the military and later settlers used the tree as target practice due to the fact that 300 lbs. of lead bullets were found in the tree trunk after it was cut down. The Council Tree grew to be 100 feet high and 16 feet in diameter with twisting branches and a unique look. One of the first recorded events, in the late 1850s, was the rescuing of a Ute girl being kidnapped and burned. In 1862 the Indian Commissioner met with several tribes under the Council Tree and the meeting resulted in a treaty. The treaty gave the land along the Poudre River to white settlers. In the late 1800s a wild fire damaged the tree, and in the spring of 1938 there was a large trash fire that nearly destroyed it completely. The tree was struck by a significant lightning bolt, stood through two floods, and survived nearly 70 more years than the average cottonwood. W.J. Morrill, a professor of forestry at Colorado State University, launched a campaign in 1939 to save the endangered species of cottonwood. The last known photograph and account of the tree while standing was in 1947. Today, the area is open space with irrigation ditches and the exact location of the tree is possibly in the middle of a pond. The general area is visible from I-25, near the Colorado State University Environmental Learning Center. a white man named Thomas Fitzpatrick found a young arapaho boy and called him “Friday” after the day of the week on which he was found. 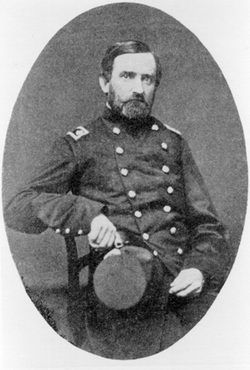 thomas took friday to St.Louis and raised him in catholic school among the whites. this experience helped friday become a peace chief and diplomat for the native Americans and white settlers. Warshinun later returned to his tribe and became a leader because of his ability to speak english and his understanding of Euro-American culture. 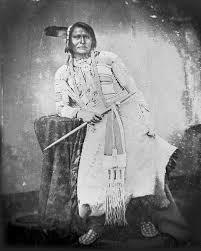 Chief Friday was friendly to the settlers because he was used to their ways having grown up among them. Settlers knew him as Chief Friday, though he was likely never a true chief. 1. Clements, Josephine. “A Page from the Past.” Senior Voice, November 1993, 22. Fort Collins Museum of Discovery Archives, Council Tree Folder.An article that details the life of Chief Friday and later attempts in the early 1900’s to try and preserve the tree. This provides some background into Chief Friday and would provide a nice general overview of his history. 2. Historic Records, “Article regarding prairie fires and the Council Tree” (Fort Collins: 1947), 51. Fort Collins Museum of Discovery Archives, Council Tree Folder. A page from a book that is describing various Indian interactions in the Poudre area in the 1860’s, the last paragraph focuses on the Council Tree. This paragraph tells how the area around the Council Tree came under the control of Whites and where the ritual burials moved to afterwards. 3. Abrahamson, Rich. “Tree Ceremony.” The Coloradoan, 1994. Fort Collins Museum of Discovery Archives, Council Tree Folder. A short article focusing on Indian ceremonies regarding the tree and a general overview of the tree’s history. This article gives us the general dates (1940-50) that the tree was last recorded as standing and descriptions of Indian rituals at the tree. 4. “Historic Cottonwood.” The Coloradoan, April 15, 1939. Fort Collins Museum of Discovery Archives, Council Tree Folder. A short article that talks about Chief Friday and the burials of Indians in the tree branches, also talks about recent hardships that the tree had faced. This article was written while the tree was still standing and describes the fire and lightning that the tree was injured by shortly before the article was written. 5. Loveland, Zethyl. “Where the Indians Met.” Senior Voice, September 29, 1982, 26. Fort Collins Museum of Discovery Archives, Council Tree Folder. 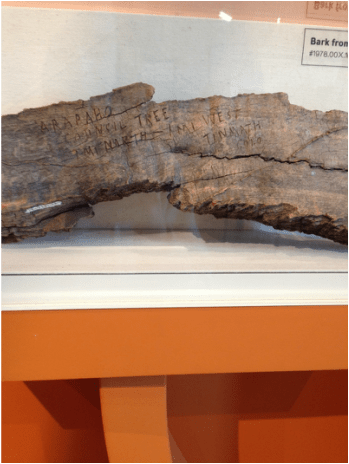 An article describing the tree itself and the early history of the tree, detailing some of the first settler interactions with Indians at the tree. We plan to use this article for descriptions of the tree itself and there’s a very good picture within the article that we could crop out and use. 6. “Letter to Miss Martha Trimble: The Arapahoe Council Tree on Robert Strauss homestead” Fort Collins Museum of Discovery Archives, Council Tree Folder. 7. “Map of Horsetooth Road and I-25 showing location of Arapaho Council Tree” Fort Collins Museum of Discovery Archives, Council Tree Folder. An aerial photograph showing the suspected location of the Council Tree with I-25, the Poudre River, and Horsetooth Road used as locators. This may be used in the final product as an image, but may also simply be used to describe the location of the Council Tree. This article is a general overview of everything else we’ve covered, but with more detail into Strauss and Chief Friday. This could be used for a more descriptive look at Chief Friday’s last years around the Council Tree and the end of Robert Strauss’ farm in the area. 9. 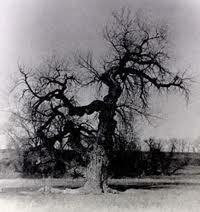 “Old Tree, Burial Place of Indians and Friend of Pioneers, Fighting for Life.” Greeley Tribune-Republican. Fort Collins Museum of Discovery Archives, Council Tree Folder. This short article describes the tree shortly before its cut down due to dying, also describes some early interactions at the tree. This article also describes the rescue of an Indian woman who was rescued from execution at the tree by Union soldiers, marking one of the first interactions between settlers and Native Americans at the tree. A short excerpt from a historical blog that describes the full life of Chief Friday and his relations with the tribe and the tree. This goes very in depth and gives us a good look into both Friday’s early life and relations with both Native Americans and settlers. Google Image Search. “The Council Tree Fort Collins.” Accessed 13 April, 2014.